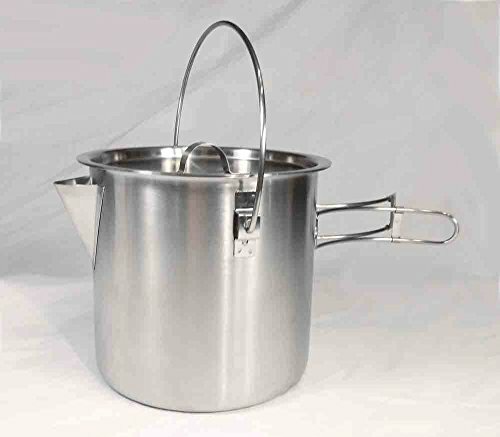 52-Ounce Stainless Steel Camping Pot Cooking Kettle - Pot will hold 68 ounces will boil 52 ounces without spilling out the spout. Top handle can lay down or stay up. Inside cover has mirror finish and could be used in an emergency as a signaling device. Excellent quality 304 stainless steel. Strong yet light weight - Weight 15 oz - Height 5 3/8" - Diameter 6" - PLUS - 2 Silicone Oven Mitts - Green , Excellent FDA food grade silicone oven mitts cold / heat resistant. From -40~+260℃ minus 40 to 500 Fahrenheit. Microwave and dishwasher safe, light weight, very compact. If you have any questions about this product by Teton Falls, contact us by completing and submitting the form below. If you are looking for a specif part number, please include it with your message.